C Comics Issue No. 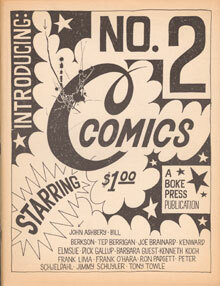 2 was published in 1965. This little magazine was edited and illustrated by Joe Brainard, with contributions by Ted Berrigan, James Schuyler, Kenneth Koch, Barbara Guest, Bill Berkson, Ron Padgett and a number of other poets affiliated with the New York School of poets. Credit: Raymond Danowski Poetry Library, MARBL, Emory University. The Robert W. Woodruff Library at Emory University will exhibit rare items, including counterculture materials, from the Raymond Danowski Poetry Library as part of the “B-Side Modernism” research fellowship and upcoming conference this month. Funded by a Mellon Foundation grant, the B-Side Modernism fellowship was established by nonsite.org in collaboration with Emory’s Manuscript, Archives, and Rare Book Library (MARBL). The nonsite.org editors selected four fellows from a competitive pool of scholars to use the Raymond Danowski Poetry Library at MARBL for primary research. Their final articles will be published on nonsite.org in mid-January to coincide with the B-Side Modernism conference, which will be held Jan. 23-24 in the Jones Room at the Woodruff library. The library will have a physical exhibit of materials from the Danowski Poetry Library on Level 2, which will debut on Friday, Jan. 16. The opening reception will take place in the Jones Room from 5-7 p.m. Friday, Jan. 23, in tandem with the conference. The exhibit and all events are free and open to the public. The Danowski Poetry Library, acquired by MARBL in 2004, consists of more than 75,000 volumes of rare and first editions of 20th century poetry, as well as supplemental counterculture material influential to these poets. Nonsite.org, an online, open access, peer-reviewed quarterly journal of scholarship in the arts and humanities, is affiliated with Emory College of Arts and Sciences. B-Side Modernism is an apt name: “It evokes a reference to record albums and the B-side of a hit record, often a great song in its own right that didn’t get the same recognition as the A-side,” says exhibit curator Lisa Chinn, a PhD candidate in English at Emory who is also the editorial assistant for nonsite.org. But, Chinn says, it also refers to being on the other side of modernism. Many scholars regard the height of literary modernism as occurring early in the 20th century, but most of the materials that the fellows focused on in their research and the artifacts chosen for the exhibit are from the 1950s-60s. All materials in the exhibit are from the Danowski poetry library collection at MARBL. The items were chosen based on the research done by the four fellows — Joshua Adams, a doctoral candidate in comparative literature at the University of Chicago; Stephanie Anderson, a PhD candidate at the University of Chicago; Rebecca Roach, a doctoral candidate at the University of Oxford; and Daniel Worden, an assistant professor of English at the University of New Mexico. Samples of C Comics and C: A Journal of Poetry, a mimeographed periodical started by poet Ted Berrigan in 1963. Issues with covers created by Andy Warhol and poet/illustrator Joe Brainard will be displayed, as well as examples of Brainard’s other work such as the “I Remember” series. Cut-ups from Williams S. Burroughs (bags of printed words cut up); a cut-in interview audio with Burroughs that visitors can listen to on headphones; and several word games created by poet and painter Brion Gysin. Little magazines published in 1963, which examined the influence of high modernism (1915-25) on this later period. Materials on display will include Nadada, and an issue of Signal magazine featuring a republication of Hart Crane’s juvenilia poem, “The Moth that God Made Blind” (written in 1916). The four fellows’ research, the upcoming publication of their articles, and the exhibit of research-related materials highlight a lesser-known aspect of the Danowski library at Emory’s MARBL that many people may not even be aware of – the counterculture influences that affected many of the poets, writers and artists of the time. The goal of the exhibit is to encourage both scholars and non-scholars to use the Danowski collection, and the myriad other collections, housed in MARBL. The exhibit will remain on view until March 15. The Robert W. Woodruff Library is located at 540 Asbury Circle in Atlanta, 30322. Parking is available in the Fishburne deck. The library will have a physical exhibit of materials from the Danowski Poetry Library on Level 2, which will debut on Friday, Jan. 16. The opening reception will take place in the Jones Room from 5-7 p.m. Friday, Jan. 23, in tandem with the conference. The exhibit and all events are free and open to the public.